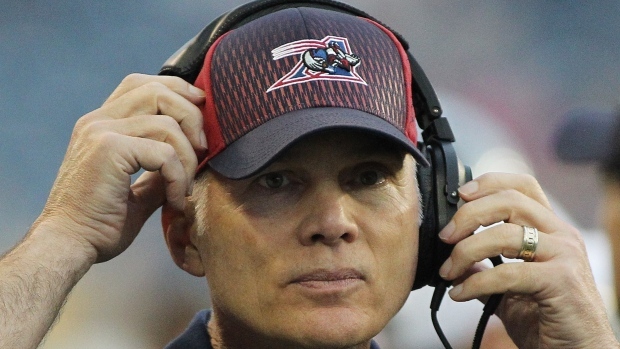 MONTREAL - Tom Higgins has been fired as head coach of the Montreal Alouettes and general manager Jim Popp will take over the job for the fourth time in his career. A brief statement released Friday evening from team owner Bob Wetenhall gave no reason for the change, which came a day after the Alouettes beat the B.C. Lions 23-13 for only their second win in Vancouver since 2000. "General Manager Jim Popp will take over the duties of head coach at this time," Wetenhall said. "Our management and I have full confidence in Jim, as do our players. "We have made this change as we believe it is in the best interest of our team, and especially our fans. We all wish to express to Tom our affection and respect, as well as our appreciation for the contributions he has made to the franchise." Higgins, a CFL veteran who had previous head coaching stints in Calgary and Edmonton, took over the Alouettes in 2014, when the team rebounded from a 1-7 start to make the playoffs with a 9-9 record. The club is 3-5 this season, mostly due to an anaemic offence and some costly errors at key moments of games. The Alouettes also lost both starting quarterback Jonathan Crompton and backup Dan LeFevour to injuries in the opening game of the season and have had to break in rookie pivot Rakeem Cato. It was Wetenhall who hired Higgins and it appears it was Wetenhall who fired him. Popp wanted the job, but the owner preferred that he concentrate on his GM duties. Popp has been GM since the CFL returned to Montreal in 1996 after a 10-year hiatus. Popp stepped in for Rod Rust for the final game of the 2001 campaign, then replaced an ailing Don Matthews for four games in 2006. He also took over from Dan Hawkins four games into the 2013 campaign. He coached the entire 2007 season, going 8-10 in what he called a rebuilding year. Popp's career regular-season record is 16-20-0, with a 1-4 mark in playoff games. He is to meet with the media on Saturday morning.